'About Accidents' by Guido Bonatti, in a Collection of Astronomical Treatises and Tables. bl.uk > Online Gallery Home	> Online exhibitions	> Illuminated manuscripts	> 'About Accidents' by Guido Bonatti, in a Collection of Astronomical Treatises and Tables. This page opens a section of a famous treatise on the stars by the 13th-century Tuscan astrologer, Guido Bonatti. Called 'About Accidents', it opens with a picture of a man holding a purse who stands beside shelves with golden vases and dishes and an open chest of gold coins. 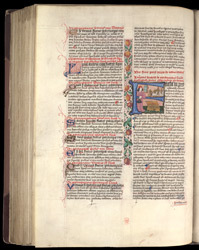 The two words in the lower margin are 'catchwords', the first words on the next page, an aid to assembly of the manuscript.